This is an interesting chart we have been meaning to put up on the site for some time. The chart tracks the price of oil (West Texas Intermediate) denominated in ounces of gold (price determined on the NY Commodities Exchanges). Our chart data reached back to 1900, so it is interesting to see the swings in the oil market without the noise from dollar exchange rate fluctuations. The data in the chart is monthly before 1982. 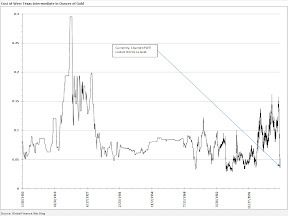 What we can see from the chart is that pricing oil in gold (as opposed to “fiat” currencies) does little to save from commodity price volatility. This is for two reasons. First, we see spikes around oil shortages. No matter what we price oil in be it dollars, gold, or heads of cattle, oil will be expensive when supply tightens or demand increases. 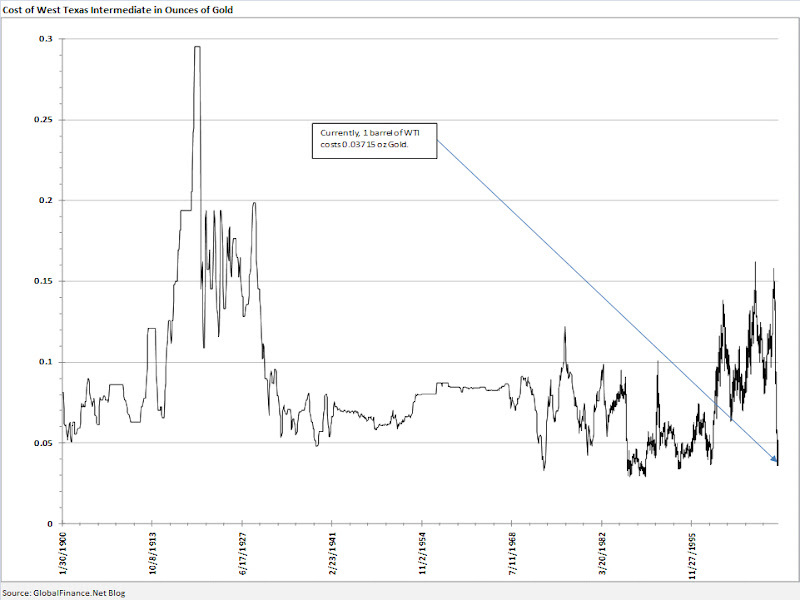 Second, the oil price in gold decreases when the price of gold increases relative to other assets. 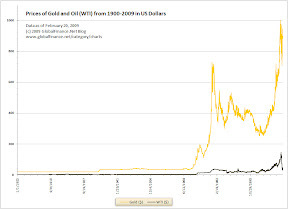 This happened in the 1980s gold spike and it is happening today as gold strengthens relative to world currencies. The chart does give some picture as to how volatile the prices for both commodities have been over the past century (and especially in recent decades). However, we should look at this chart alongside the first chart to recognize that blending commodity risk (backing the dollar with gold) would actually increase volatility, not decrease it.